The socially-minded brand has ignored the demands of migrant workers in its supply chain. 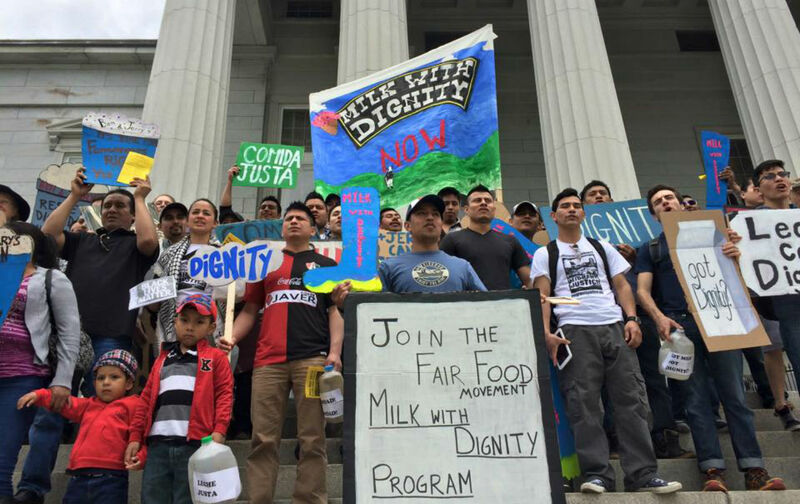 The grassroots group Migrant Justice launched the Milk with Dignity (MWD) campaign last year to push a comprehensive labor monitoring plan for the dairy labor force, which would establish standards on wages and labor conditions set by workers themselves, supported by independent auditing, worker education, and a scheme for equitable profit-sharing among workers and farmers. The system is modeled on the Fair Food program of the Coalition of Immokalee Workers, which has successfully organized across the supply chain, wholesale to retail, to raise wages and broadly improve labor conditions on Florida tomato fields. For Vermont’s 868 dairy farms, with some 1,200 to 1,500 migrant workers, MWD seeks not only higher wages but also decent housing and leave times, protection from discrimination and greater autonomy and a say in their working conditions. Milk with Dignity from molly stuart on Vimeo.